This Cisco High-Density Extension Module for voice and fax has 8 FXS and DID ports. Individual ports on the baseboard module can be configured for FXS or DID signaling. An on-premises FXS interface connects directly to a standard telephone, fax machine, or similar device and supplies ring, voltage, and dial tone. Signaling support available in FXS mode includes loop-start and ground-start. DID trunks from the central office can be connected to this Cisco High-Density Extension Module baseboard for off-premises connections. Signaling support available in DID mode includes immediate, delay dial, and wink start. 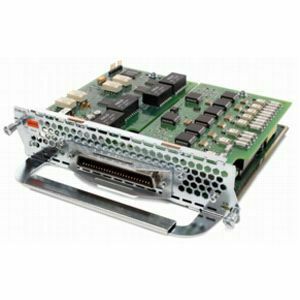 Users plug in up to two expansion modules in any combination to increase the voice and fax capacity of this Cisco High-Density Extension Module baseboard.